Got frosting? 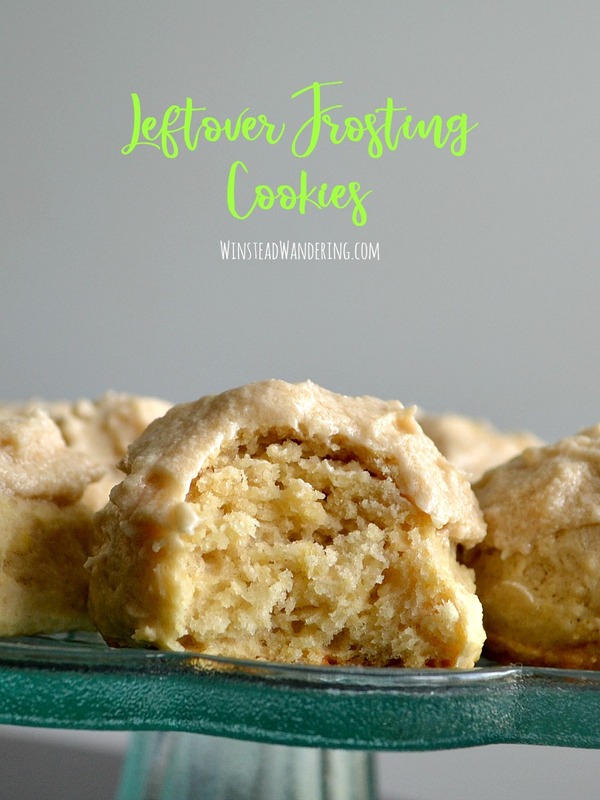 These Leftover Frosting Cookies are easy to make, perfectly fluffy and sweet, and such a fun way to use up what’s left after you make a cake or cupcakes. I don’t often find myself with leftover frosting, and it’s even more rare that I have enough to do anything with (other than eat, of course). But sometimes that happens, and when it does, I’m definitely not interested in using the frosting to make something time-consuming. Enter these Leftover Frosting Cookies. 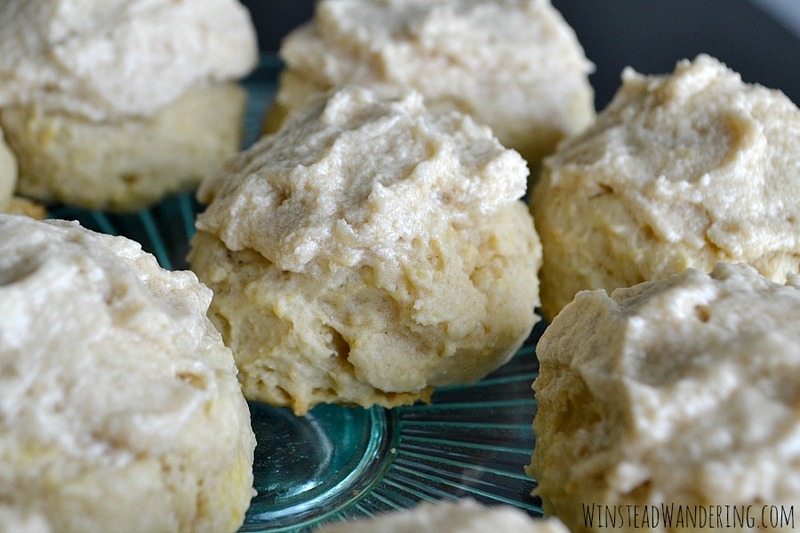 They’re super easy to whip up and, while they’re definitely a sweet treat, they aren’t cloyingly sweet like frosting can be. Plus, I like to make these cookies small, so they’re just a couple bites of goodness. 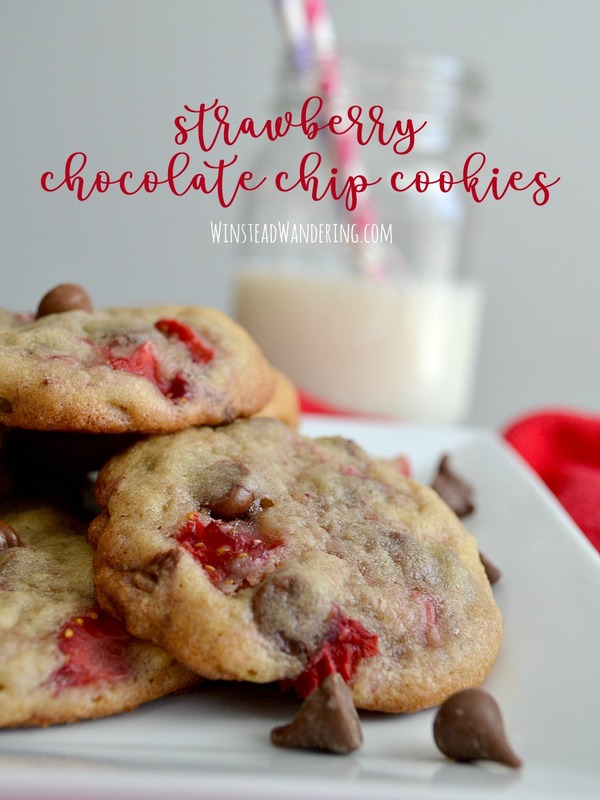 Add a whole bunch of chopped berries to a classic dessert recipe and you get these sweet, chewy, tart, and decadent Strawberry Chocolate Chip Cookies. On Wednesday nights, I cook with the youth group at church. The idea is to teach them some basic kitchen skills while also preparing meals that can be given to church members who need them. It’s often the highlight of my week, partly because I have a ton of fun and partly because the kids are constantly cracking me up with their lack of kitchen common sense. What does that have to do with Strawberry Chocolate Chip Cookies? Nothing, really, but that’s okay. We can take a sec to talk about the recipe. 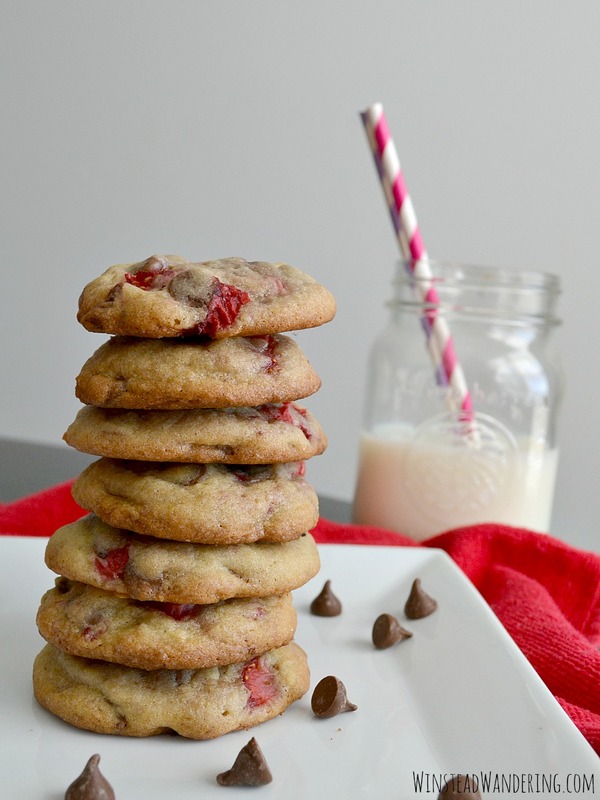 I’m a chocolate-covered strawberry junkie, so making these cookies was a no-brainer. They turned out to be perfectly chewy and sweet, and the berries, after baking, were just a touch sour. The combination is an addictive cookie that I ate way too many of. 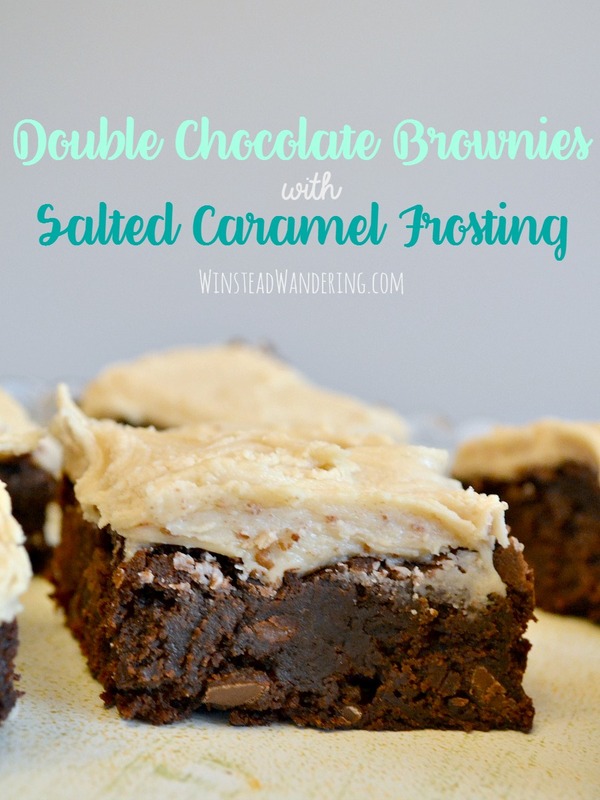 Double chocolate brownies with salted caramel frosting are a rich, decadent homemade treat that’s perfect for an indulgent dessert or weekend gathering. One of my favorite ways to show people love and appreciation is through food. I’m sure this is at least partly due to my own love for food, but it’s also because food is universal. You don’t have to know someone’s preferred lotion scent or shirt size to express gratitude with food. 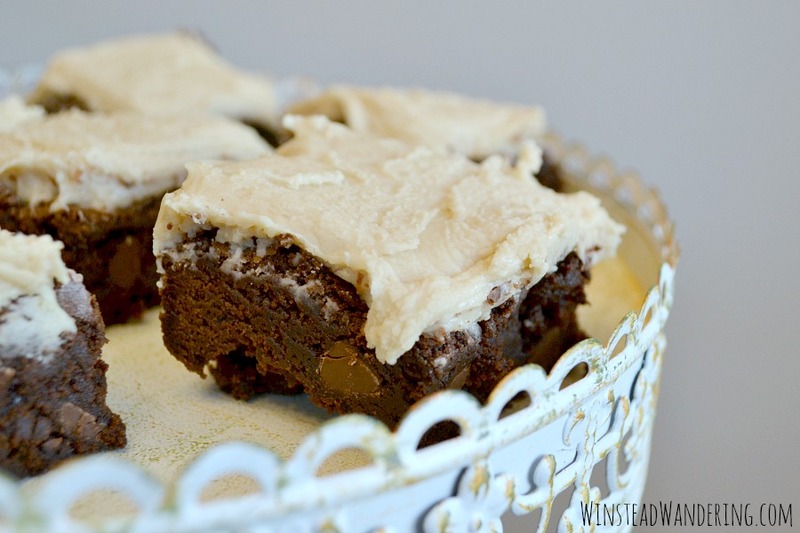 I made these double chocolate brownies with salted caramel frosting a few weeks ago for two special coworkers. The first, a fellow English teacher, is currently fighting cancer. My mother-in-law was planning to bring her family supper one night and asked if I’d like to make something sweet to go with it. Naturally, I jumped on the offer because I’d had this recipe in mind to try and because I wanted to show love to the family. Also, I’d been planning for quite some time to bake something chocolate for another coworker. His planning period is the last period of the day and he’s always quick to volunteer to cover classes for J and me when we have to leave early (usually for children’s doctor-related reasons). His wife, G’s kindergarten teacher, told me he loves anything chocolate, so I figured I couldn’t go wrong with this recipe. 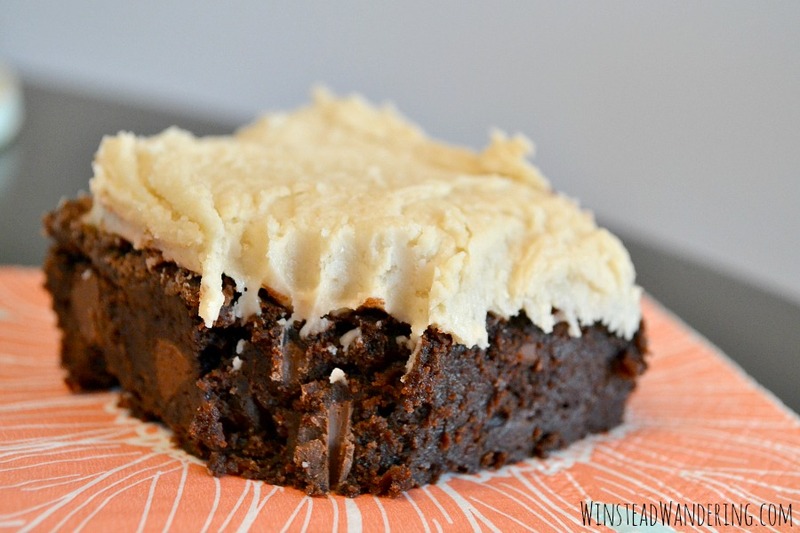 Like my triple chocolate frosted brownies, this recipe starts with my double chocolate brownies. It’s a homemade brownie recipe that’s thick, fudgy, and ten times better than a boxed mix. While the brownies are cooling, make a simple caramel on the stove, leave it to sit for a couple minutes, and then beat it with powdered sugar for a rich frosting. 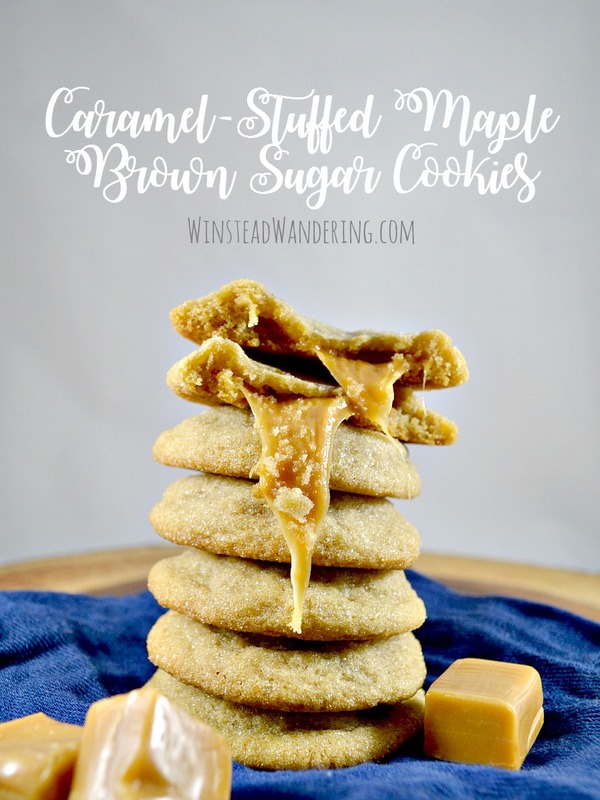 One bowl, no mixer, and a perfectly sweet and chewy dessert: Caramel-Stuffed Maple Brown Sugar Cookies are indescribably decadent. If you’ve read any of my recipe posts– or if you know me in real life- you’ve probably picked up on my love for chocolate. I’ve got a lot of chocolate recipes. My addiction to love for chocolate means, if I’m going to get in the kitchen and bake something sweet that doesn’t contain chocolate, it better be really freaking good. 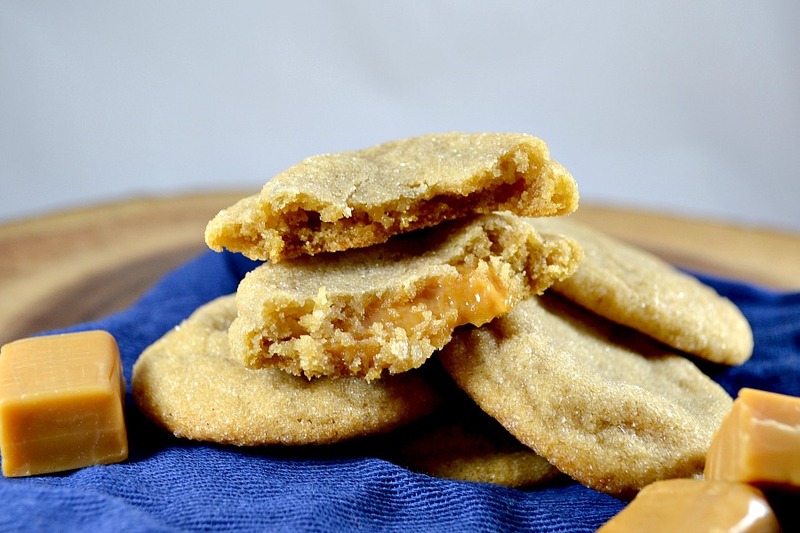 These Caramel-Stuffed Maple Brown Sugar Cookies more than meet that requirement. The dough is made entirely with brown sugar instead of white, resulting in an unbelievably chewy cookie. Before baking, the cookies are rolled in white sugar. The coating makes the finished product sparkly and adds extra chewiness. As for the caramel center, it gets soft and gooey in the oven, turning an already-dynamite cookies into an over-the-top indulgence. 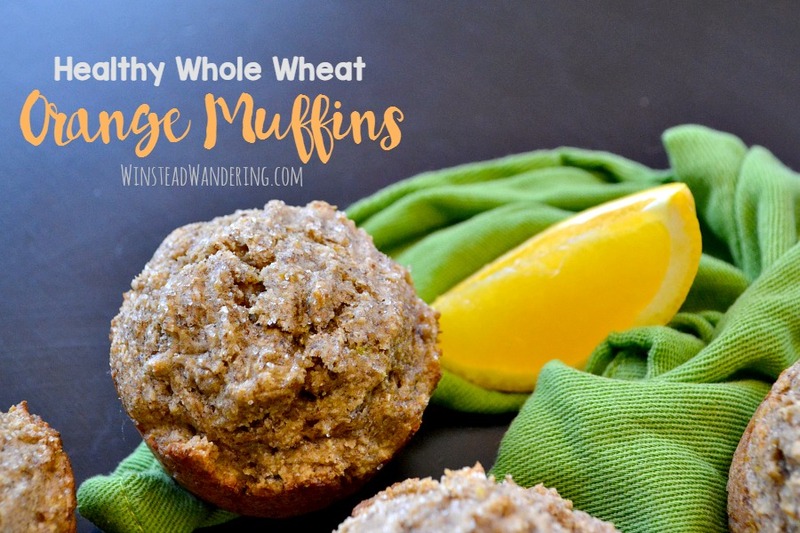 Healthy whole wheat orange muffins are sweetened with honey and fresh orange juice for the perfect bright, guilt-free snack or breakfast. I love sharing my passions with my children as they get older. I love cooking and baking, of course, and B has recently expressed an interest in helping me in the kitchen. One of the biggest perks of this, I’ve discovered, is she ends up eating foods she otherwise wouldn’t. 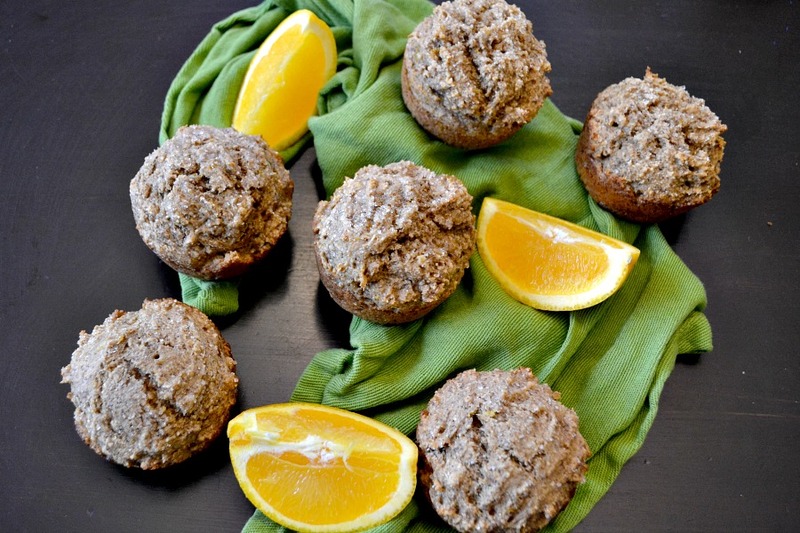 One of our most recent creations was these healthy whole wheat orange muffins. B and I stayed home from church because she was dealing with some asthma issues, and we had a bag of oranges that needed to be used, so we pulled a bar stool over to the kitchen island and whipped these up. My intention was to create a healthy muffin recipe, so I left out chocolate, sugar, and butter/oil. Instead, I sweetened the muffins with honey and used applesauce for moistness. I did sprinkle the tops of the unbaked muffins with organic cane sugar for a little texture and sparkle, but that’s optional. We love this recipe. The muffins aren’t overly sweet; they’re definitely a healthy muffin as opposed to a dessert muffin, but that’s the point. The fresh orange juice and zest give the perfect amount of brightness, while the flax meal and whole wheat flour make them hearty. 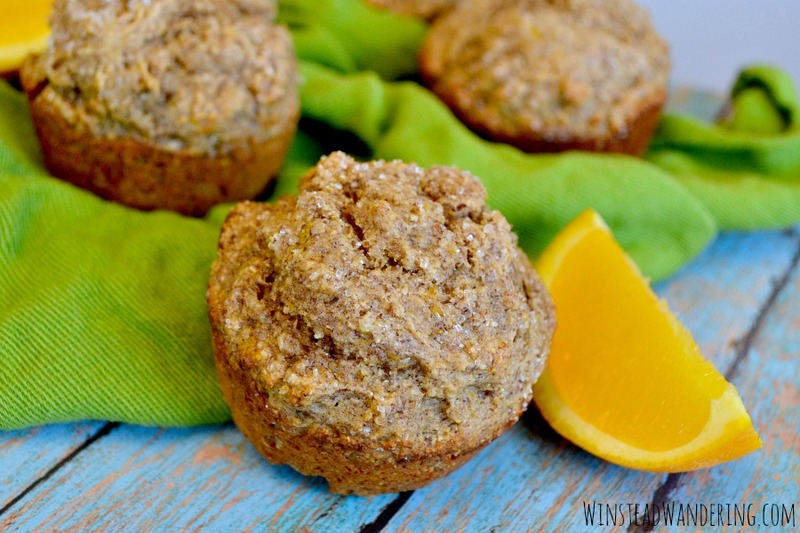 I think these healthy whole wheat orange muffins are perfect as is, but you could definitely add dark chocolate chips, cranberries, or blueberries. I’d love to make a version with maple extract, too. Of course, if you want to lose the healthy part, you can make a sweet orange glaze. 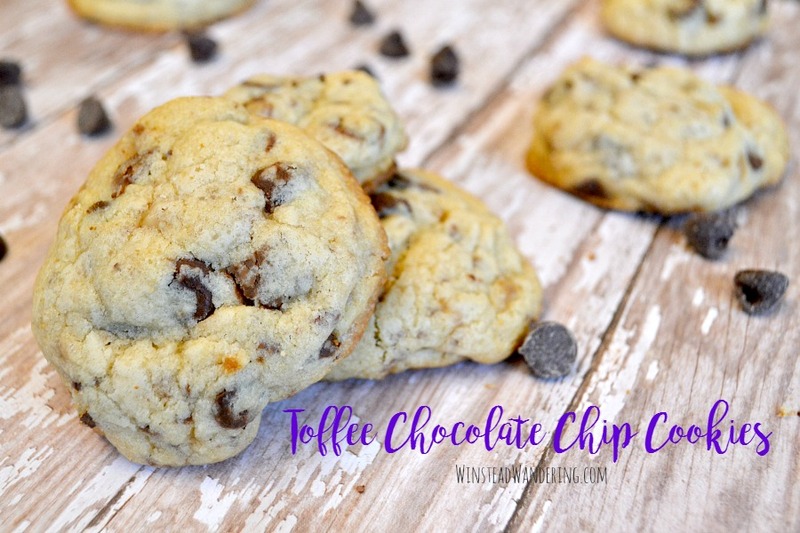 Toffee Chocolate Chip Cookies are the much-loved classic treat with the added bonus of being packed full of chewy chocolate-covered toffee bits. I’m teaching English for the first time this year. Have I mentioned that on the blog yet? Though my degree is in business, I’m doing my best to teach my freshmen the ins and outs of symbolism, grammar, and whatever else I’m supposed to be covering. One of the best parts about this semester is that I get to teach To Kill a Mockingbird. It’s one of my all-time favorite books so, as you can imagine, I’m having a blast reading it with my English I Accelerated students. Many of my students are loving it, too. They’re loving it so much they rocked our first test and, as promised, I baked them a treat to celebrate. I debated what to make them. A lot of the teenagers I know don’t have the most adventurous palates, so I settled on these toffee chocolate chip cookies. 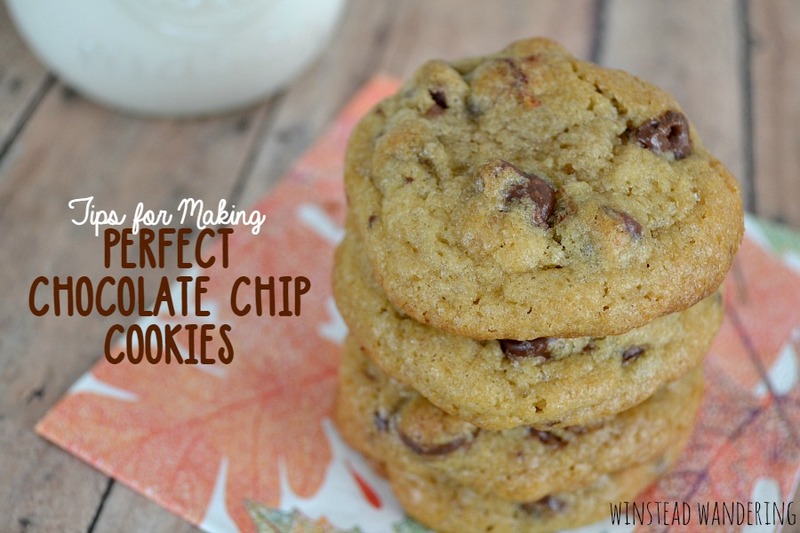 You can’t go wrong with a good chocolate chip cookie, especially if you know the right tricks. I did want to make them a little more special, though. I tossed in a bag of toffee bits and the end result was a cookie loaded with semi-sweet chocolate and chewy chocolate-covered toffee bits. 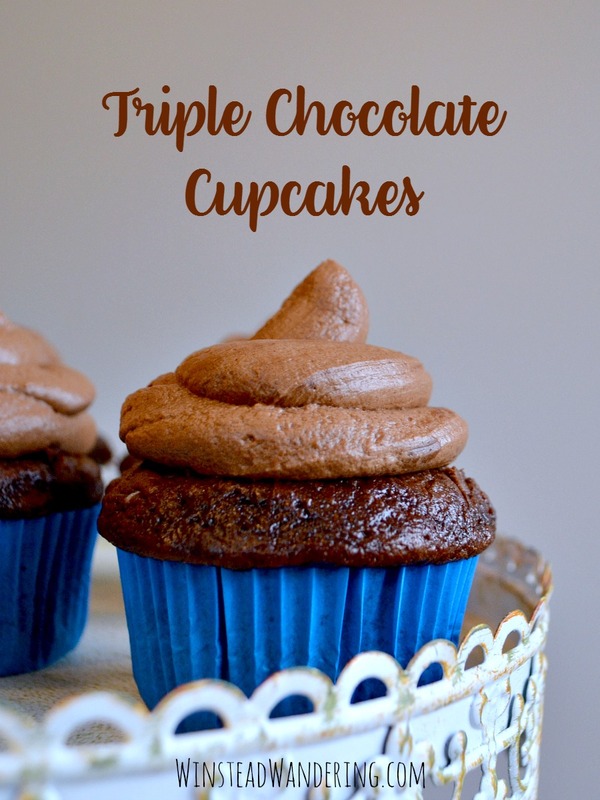 Stuffed with a rich chocolate ganache and topped with the fluffiest chocolate buttercream, these triple chocolate cupcakes will fulfill all your chocolate fantasies. I signed up to bring cupcakes to a baby shower at church a couple weeks ago. I knew right away I wanted to make something decadent and over the top, something the expectant mom would love to indulge in. 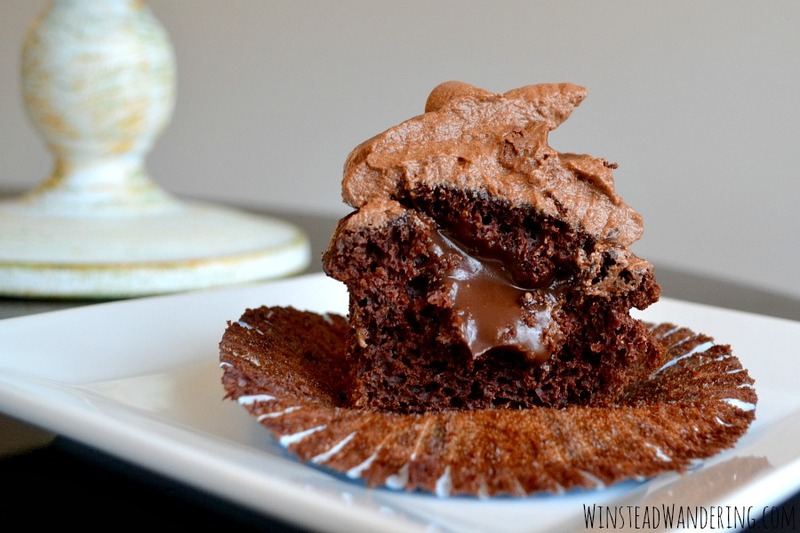 I knew it had to be these triple chocolate cupcakes. To say they were a hit would be an understatement. And seriously, how could they not be? That moist cupcake? That smooth ganache? That rich and fluffy homemade buttercream? These guys are literally one of the best things you’ll eat. Don’t be intimidated by the multiple steps or the long list of ingredients. The cupcakes themselves are made with a box mix, and then enhanced with a few extra ingredients. The ganache takes only a few minutes to make and is so worth it. The ridiculously light frosting is the perfect topping. 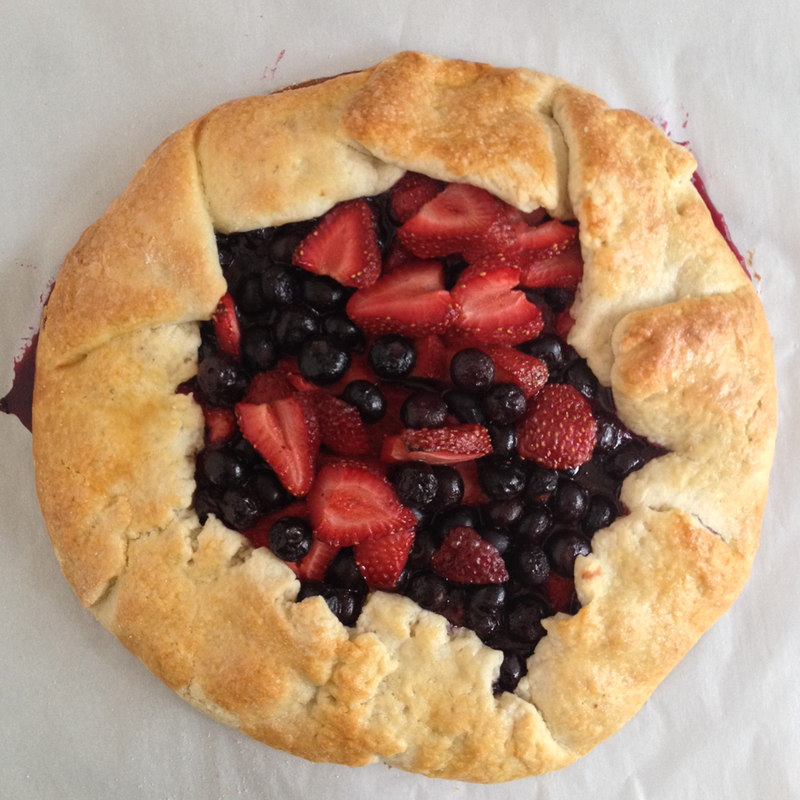 This summer berry crostata is a rustic homemade dough packed with juicy strawberries, plump blueberries, and the perfect complement of spices. I’m taking a short blogging break to soak up time with my sweet newborn baby. Things won’t be silent around here, though; I’ve got some awesome bloggers lined up to step in and share some great content. Today, Lecy from A Simpler Grace is here sharing a must-make summer berry recipe. 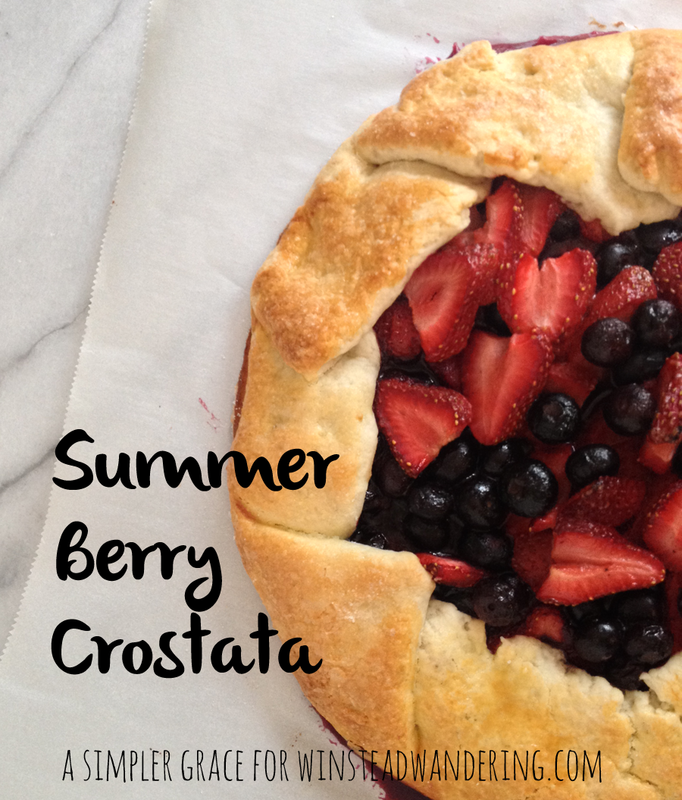 I’m so excited to be here, on Winstead Wandering, and sharing my Summer Berry Crostata with you today! One of my favorite things to do is cook traditional Italian food and the only thing I love more than that is baking Italian pastries. Ok, maybe eating Italian pastries ranks up there too. I created this crostata recipe for a cookbook draft I’m working on and it’s one of my family’s favorites, so when Abby asked me to share a recipe with you all, I knew this was the one! The term crostata might sound fancy, but it’s really just a free-form tart or pie and can be filled with a variety of things, but summer fruits are the best! 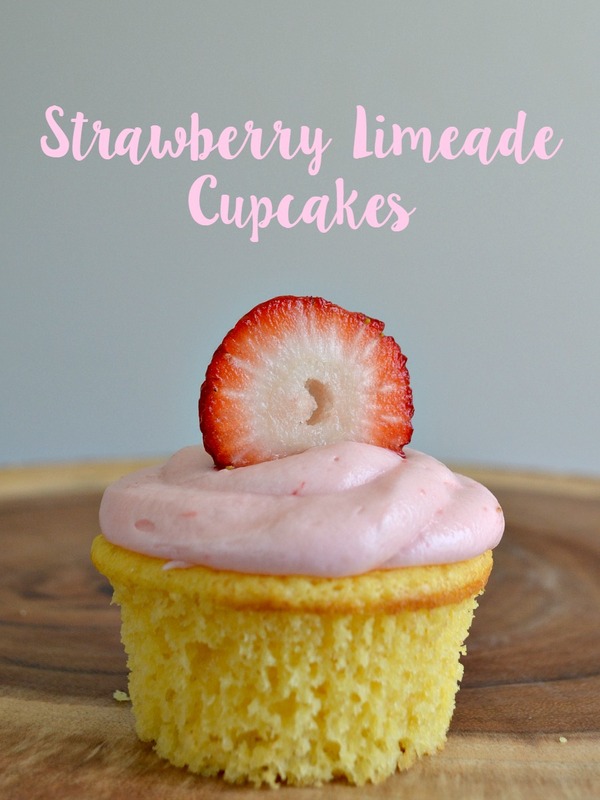 The perfect balance of tart and sweet, these strawberry limeade cupcakes are a refreshing treat for just about any occasion. I made these cupcakes for a baby shower I attended recently. Actually, it was more like a baby sprinkle, and it was partly mine. We had a small faculty and staff gathering to celebrate the sweet baby girls another teacher and I will be welcoming soon. Because I never turn down an opportunity to bake, I volunteered to make cupcakes. I knew right away I wanted to make a cupcake with strawberry frosting. I made some last year for B’s birthday and it was to die for. The recipe never made it to the blog, though, so I decided to recreate it. 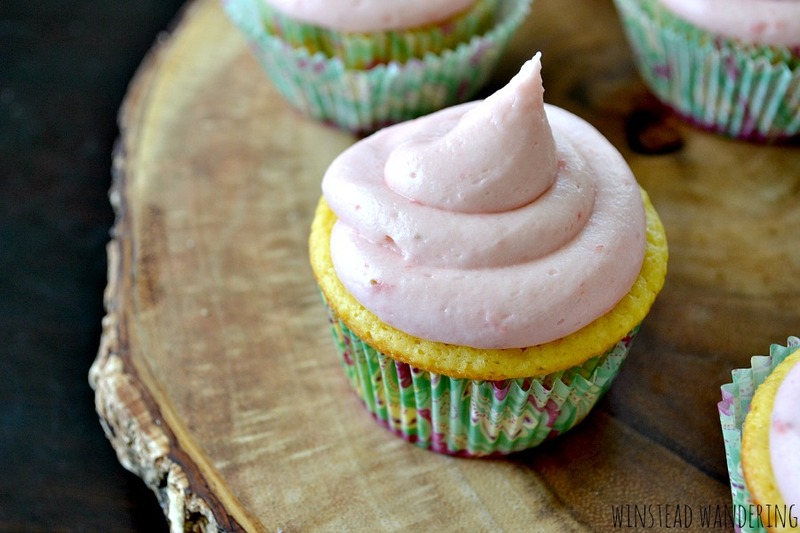 It wasn’t until the last minute I decided to step the whole thing up a level and make strawberry limeade cupcakes. I did cheat and use a box mix. Sometimes I make cakes from scratch, but when I’m pressed for time, I’ll opt for homemade frosting over homemade cake every day of the week. To me, there’s just no comparison. I went with a regular yellow cake mix, because that’s what I had and because I’m really not a fan of the flavored cake mixes, like key lime or strawberry. I prefer to use a basic mix and add the flavors myself. It makes the final result taste much more fresh and homemade. As it turns out, the shower wasn’t actually for four more days. So I just brought these beauties to school and left them in the office, where my coworkers were kind of enough to polish them off for me. Can you say pregnancy brain? You don’t have to be a professional baker to make fluffy, chewy, perfect chocolate chip cookies. Follow these tips and your cookies will come out flawless every time. 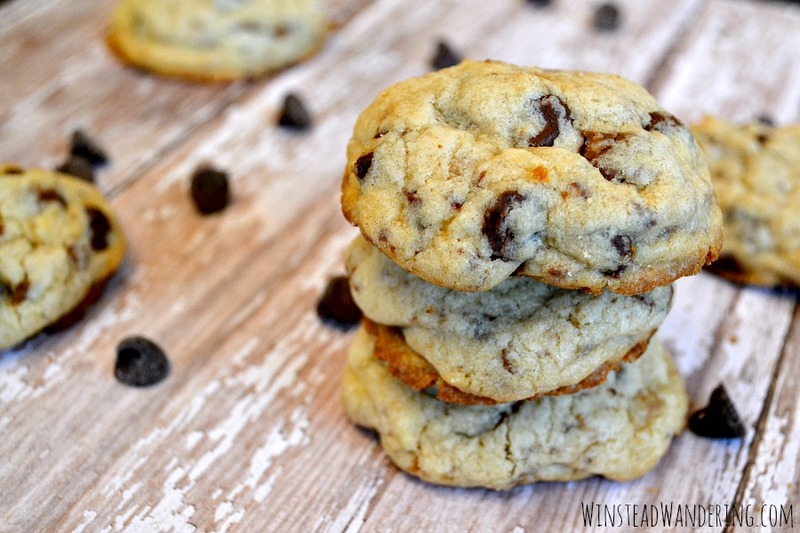 Chocolate chips cookies are a universally-loved dessert, right? If you’re out of baking ideas- or if you just don’t like to be in the kitchen- you can never go wrong with chocolate chip cookies. Then why are they so hard to make? They must be because people continue to be satisfied with store-bought logs of dough or place-and-bake imitations. Don’t get me wrong, I’ve enjoyed both of those varieties on more than one occasion. I’m not known to turn down a chocolate chip cookie, no matter its origins. But the thing is, people think those cookies are as good. Like as-good-as-homemade good, even though they’re far from it. And I’m convinced that cookie lovers everywhere would reject those pre-made impostors and make their cookies from scratch if only they realized how easy it is. It is. Easy, that is. So easy. Can I tell you a secret? 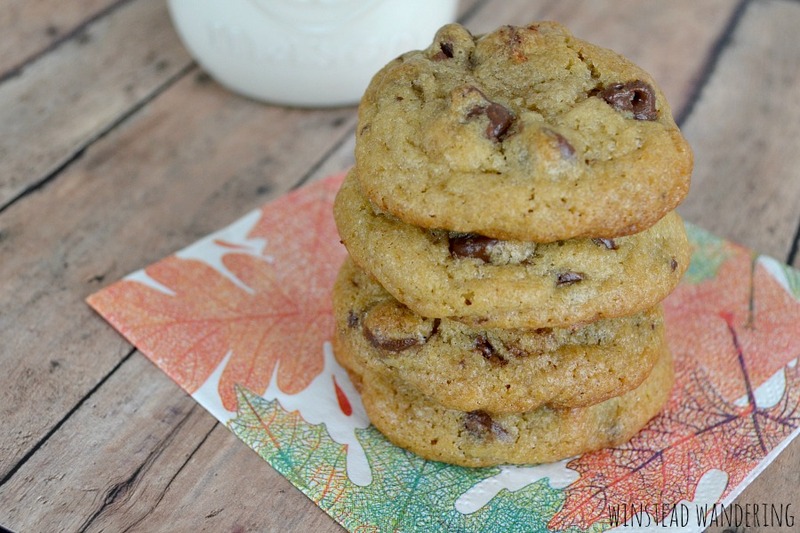 My homemade chocolate chip cookies are ah-mazing, but I don’t have a special recipe. I just follow the instructions on the bag of chocolate chips- whichever brand I happen to be using- and make a few special adjustments. The result is perfect chocolate chip cookies. Every time. It’s a rare thing for me to plan to make cookies in advance, which means I usually don’t have to set butter out to soften. Instead, I microwave sticks- straight from the fridge and still in the wrapper- for eight seconds at a time, turning them in between, until they’re soft. No more starting with melted butter. I know it’s in the instructions, bu I used to dump all the ingredients in the bowl and mix. My cookies tasted great, but the texture wasn’t as soft as it could be. One day, on a whim, I decided to cream the sugars with butter. The resulting cookies were fluffy and chewy without the slightest bit of graininess.